This summer Kyrie Irving shook up the sports world when he walked into the office of the Cleveland Cavaliers and demanded a trade from a team that has just played in the NBA Finals for the third year in a row. Not only that, along with LeBron James he had been a key catalyst to the Cavs winning a championship. With Cleveland, Irving was a clutch performer and a reliable scorer, but now as a member of the Boston Celtics he’s become much more and is arguably considered the best player of the team with the best record in the NBA. He’s being referred as the leader of a team that won 16 straight games after losing the first two of the season and losing SF Gordon Heyward in their opening match against the Cavaliers. During the streak, they not only had to adjust to the loss of Hayward, but they also had to deal with losing Al Horford and Marcus Morris as well. Despite their 104-98 loss to the Miami Heat yesterday, Irving ignited the Celtics with his play and helped them overcome those injuries to engineer the 16-game winning streak that has turned them into the early-season favorites to represent the Eastern Conference in the NBA Finals. Irving is flourishing in Brad Stevens system and turning into a fierce defender that leads the best defense of the league and a great passer that fuels the Celtics motion-based attack. 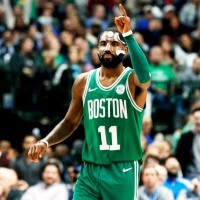 With his scoring and physical play Irving is proving that he can lead this team as he’s become Boston’s most skilled player, and with his great passing, he has helped the Celtics new pieces come together because he gets everyone involved. He’s putting up MVP-caliber performances, and if he keeps it up he could end the season atop the race for the coveted award. Not only that, but he could help the Celtics put an end to the Cavs three-year reign atop the Eastern Conference and help the league avoid a fourth straight NBA Final between Cleveland and Golden State.